Station Hollywood: Happy birthday to Arshad Warsi. Happy birthday to Arshad Warsi. The viewers of bollywood films wish happy birthday to Arshad Warsi on 19th April, 2018. During the last few years he had featured in one successful bollywood film out of every four films released during that period. 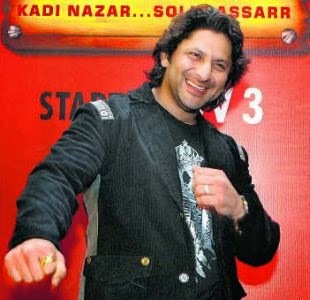 In 2011, Arshad Warsi was successful in the film Double Dhamaal. He acted alongside Sanjay Dutt, Ritesh Deshmukh, Javed Jaffery and others. Although the film did not do great business, his performance was appreciated by the audience. His greatest recognition came in the role of circuit in the film Munnabhai MBBS and Lageraho Munnabhai. In both of these films he had played the role of the assistant of Sanjay Dutt and used his gundas to evict tenants and other persons when they were paid for doing so. Both the films were serio-comic in nature and in that respect Arshad Warsi’s comedy conception entertained the viewers. In Munnabhai MBBS he used his muscle power to help Sanjay Dutt for giving exam on medical science and also for treating patients. In Lageraho Munnabhai, he compelled the academicians to give answers to Vidya Balan on questions related to Mahatma Gandhi on behalf of Sanjay Dutt. Sanjay Dutt knew nothing about the questions but due to the help of the academicians proved before Vidya Balan that he was a learned Professor. Arshad Warsi’s lips in the songs “lage raho munnabhai”, and “munnabhai mbbs” in both these films require special mention. Arshad Warsi had been great asset to the bollywood industry for his comedy skills especially due to the fact that in the last few years the only type of films which did steady business includes comedy films. His performance in the film Maine Pyar Kyun Kiya, with Sanjay Dutt and Isha Koppikar requires special mention. While Sanjay Dutt was an orthopedic surgeon in the film Arshad Warsi was an actor. He made an excellent submission in an artificial courtroom where the divorce of Salman Khan with Sushmita Sen was organized to impress Katrina Kaif. His comparison of Salman’s relationship with Sushmita Sen with a car whose break had failed and which dashed with every object on the road made everyone laugh. His lips in the song “saajan” along with Isha Koppikar, was equally impressive. Similarly he had done a great job in the film Salaam Namaste with Saif Ali Khan in the role of a lawyer. Whenever Saif Ali Khan required legal assistance during fight against Preeti Zinta he took the help of Arshad Warsi and he gave a witty answer. His performance in the film Dhamaal was equally brilliant. He was one of the four friends including Ritesh Deshmukh, Javed Jaffery and other who went to Goa to get treasure. They were stopped at every point by Sanjay Dutt, the police officer who also went to Goa for the treasure. At the end of the film the money had to be given for the cause of orphan children. In 2010, he had already showed his metal in the film Ishqiya, with Vidya Balan and Naseeruddin Shah and the film You, me and ghost. Ishqiya had got both commercial success and critical acclamation. Arshad Warsi had started his own production and is committed to do well there too. In 2014 he acted in the film Ishqiya 2, with Naseeruddin Shah and Madhuri Dixit. Although the film did not do great business but the film was appreciated. Arshad Warsi was sublime in many films including Golmaal and Golmaal Returns and viewers expect the ever-smiling talented actor to continue his brilliant work in future also.